Sitting on the back of a giant turtle swimming though space stands four large elephants. Sitting on the backs of those elephants is Discworld: a flat world filled with many different people, animals and gods...and other strange things. The large city of Ankh-Morpork is where the story starts. There is a delightful, and perpetually optimistic, little man by the name of Twoflower. He comes form the Counterweight Continent (or the other side of the world). He has decided to take a trip and visit the famed city, to watch heroes and mercenaries and wizards and so forth. Only he doesn't realize how dangerous the city can be and he soon falls under the protection of Rincewind; a failed wizard who only knows one spell because it was permanently burned into his brain not allowing him to remember any other spell. All he has to do is to say it once and he'll forget it, but he can't since it's one of the eight most powerful spells in all of Discworld (only he doesn't know which one) and if he says it, it might just blow up the planet. 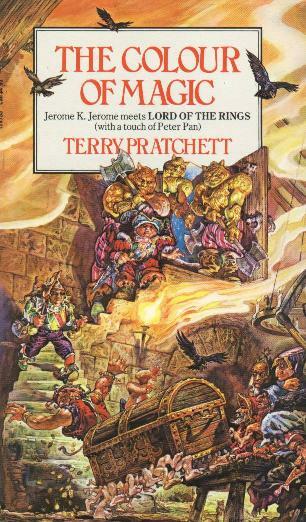 Rincewind, a very cynical coward, has suddenly found himself as a sort of tour guide for Twoflower and the man's Luggage, which walks around on hundreds of little feet that follows his master around and eats anything (or anyone) that tries to harm him. After the city of Ankh-Morpork is 'accidentally' set on fire, the two of them are off sightseeing in the rest of the continent, which brings them in contact with gods and trolls, evil demons and heroes, real imaginary dragons...or imaginary real dragons, Death himself, and, most importantly, the Edge of the World. None of which Rincewind is very happy with, but he's just sort of along for the ride. This is a very funny book. It is light and cute and absolutely excellent. There's nothing at all deep or meaningful in this story and there isn't supposed to be. It's just a few short stories about two colourful characters (three if you count the Luggage). There's such a rich world that is found in this book. I don't think the normal rules of physics apply at all, but hey it's a giant flat world sitting on the back of four elephants, riding a large turtle, I don't think that physics has much to do about anything in this book. That's not to say that everything isn't well thought out, the details and depth to the universe is astounding, very creative, but just as unserious as the rest of the book. If you want something light and fun then this is the book for you. If you want something dealing with serious issues and is deep and meaningful, the go somewhere else.